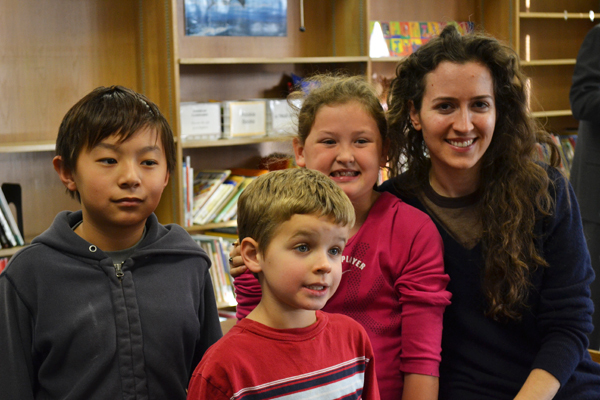 Women’s US Chess Champion Irina Krush visited Dicken Elementary Nov. 1. She was invited by the school’s chess club teacher. Irina Krush understands why some might think chess is boring. The quiet, classic game of strategy doesn’t scream exciting. But for Krush, the 2012 U.S. Women’s Chess Champion, chess is exciting. The game has taken her to countries all over the world. She has won the U.S. Women’s Chess Championship four times, winning her first title at just fourteen in 1998. She’s now ranked 27th in the world. She holds the title of International Master, which is one step below Grandmaster, the highest title a chess player can reach. And she’s only 28. 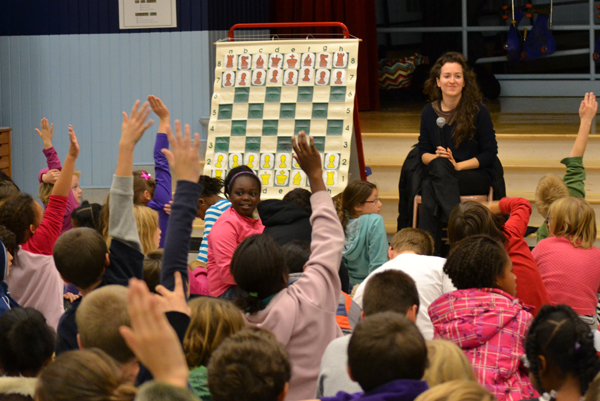 Krush shared her passion for chess with Dicken Elementary Nov. 1. At an assembly, she shared stories of her world travels, and later she shared her expertise with Dicken’s after-school chess club. Krush with the school’s chess club. “A book is not fun if you don’t know how to read, right? That’s the same thing with chess,” she said. 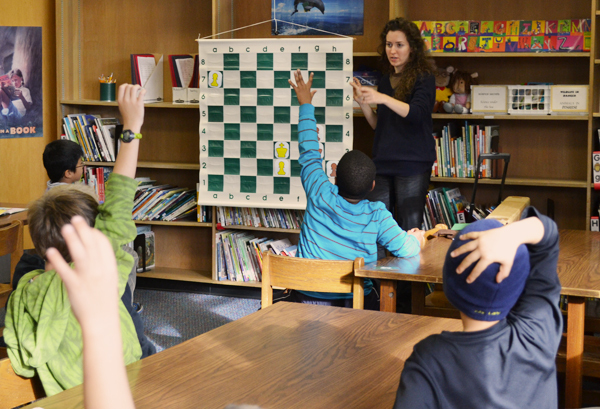 At the chess club, Krush schooled the students in “reading” a chess board with the patience of a skilled teacher. She first walked them through the “king and pawn endgame” strategy. One by one, the students quietly moved from their seats at tables to the floor in front of Krush to better hear her speak. Eight-year-old Ava Erhardt hurriedly scribbled detailed notes during Krush’s visit. “I was writing the stuff that she was talking about, so I remember it the rest of my life,” she said. Ava, who’s played chess since she was in kindergarten, was eager to meet an accomplished female chess player. “I don’t really know a lot of women chess champions,” she said. Krush has lived in Brooklyn, New York since she was five. Her family immigrated from Odessa in the USSR (now Ukraine). She said her own home in Brooklyn survived Hurricane Sandy, but many people near her were not as lucky. “My neighborhood was hit pretty hard,” Krush said. “A lot of people I know are without electricity, without phone coverage, their basements flooded.” Because her flight was cancelled, she made the trip to Michigan by car. After competing in the Michigan Chess Festival’s Fall International Chess festival this weekend, Krush is now in Khanty Mansiysk, Russia for the Women’s World Chess Championships.